"Eyes to the Skies Balloonfest"....... Guy will once again be the Balloonmeister for the "Eyes to the Skies Balloonfest", in Lisle, Il. Guy has been offering this service to many events for more than 30 years. If you are interested in having Guy as your Balloonmeister or would like an invitation to this event, give him a call or send an email with your request. This years festival will feature 20 balloons and a limited number of special shapes. Once again pilots will be compensated and treated to a great time. If you would like to attend Check out the festival at www.eyestotheskies.org We expect to have complete pilot entry forms available online within the week. Call or email Guy with any questions. 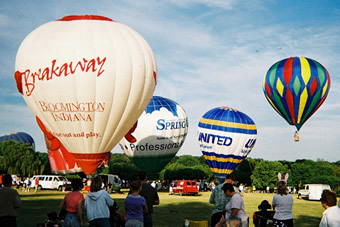 Guy Gauthier....... will once again be the Balloonmeister for the "Eyes to the Skies Balloonfest", in Lisle, Il. Guy has been offering this service to many events for more than 30 years. If you are interested in having Guy as your Balloonmeister or would like an invitation to this event, give him a call or send an email with your request.